Welcome to the NBA 2K19 portal! This is a central hub for all the NBA 2K19 content here at the NLSC including news, reviews, feature articles, downloads and more. Download all of the latest roster updates, player faces, and a comprehensive shoe pack, in today's File Additions for NBA 2K19. In this week's Monday Tip-Off, Andrew takes a shot at repaving the Road to 99, suggesting new ways of rewarding players as they level up in MyCAREER. 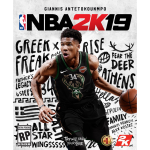 In Episode #279 of the NLSC Podcast, Andrew and Arcane break down the problems with 2K Pro-Am, and suggest how the mode can be fixed in NBA 2K20.